The Channel Master 4251 is generally regarded as the most powerful consumer UHF television antenna ever produced. The 4251 has acquired somewhat of a legendary status because production stopped sometime around the year 2000, and no comparable consumer antenna is sold today. It was a 7-foot parabolic dish, similar in design to a satellite dish, but designed for a different set of frequencies. The sheer size of the 4251 meant a large signal capture area, and the parabolic shape meant that it could focus and amplify signals better than any other television antenna available. Unfortunately, that sheer size also meant a large area to catch the wind. A 4251 required careful anchoring to prevent damage during high winds. Now that the digital television conversion has created renewed demand for television antennas, I’m somewhat surprised that no company has developed a consumer parabolic UHF antenna. The awkwardness and size of the 4251 made them uncommon, but there used to be two installed in our area. The huge parabolic dish and the solid bow ties made them quite noticeable, not to mention the many guy wires anchoring them to the roof. Neither one is still installed, replaced by DISH Network and DirectTV dishes. I was reminded of the Channel Master 4251 when I found Joe Robert’s excellent Channel Master 4251 Tribute Page. I never had a chance to see a 4251 up close, so I was intrigued by his pictures, the background information, and his story of buying his 4251. 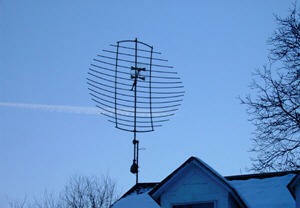 If you have any interest in classic antennas, then his page is well worth a look. Matthew, Yes I agree that this was the pinnacle antenna the American antenna industry ever produced out of the box. I have personally install hundreds of the 7′ 4251 Parabolic antennas manufactured by Channel Master in the 70’s, 80’s & 90’s. I purchased a dozen of them back in 2001 when I heard that Channel Master was discontinuing production. I still have 3 of them left, two of them brand new in the box. I have been saving them since 2001 for special applications. 20 years ago I mounted two of them side by side on my 110′ home tower here in Northeastern Indiana for DXing. I’ve pulled channels from Green Bay, WI, Chicago, ILL, Cleveland, OH, Indianapolis, IN not to mention the 105 tri-state area TV channels. The only TV Antenna array that comes close is the stacked Super G-1483 UHF Antennas at 15db gain. The CM 4251 was indeed one of the best UHF antennas produced. Unfortunately the dies that were used to form the horizontal and vertical ribs of the parabolic reflector became worn and Channel Master at the time did not have the funds to have them reproduced. The result was that they stopped production of the 4251. One former member of the WTFDA , Worldwide TV/FM DXing Association, who did antenna installations had contacted Andrews Electronics to see if they would produce the 4251 again. At first they said they would, but once they checked into it they found that they dies were worn out and they could not find the original specification sheets that Channel Master had used to produce them. Apparently one of the past owners of Channel Master had thrown the original specification sheets away without realizing what they were. As a result Andrews Electronics said that they didn’t have the specifications needed to reproduce the dies and the antenna reflectors. The bowtie receiving elements were a key factor in the reception ability of the CM 4251 antennas. They were much better than the design used on the Finco and Antennacraft parabolic UHF dish antennas which used a folded dipole I believe. I am glad I kept my Channel Master 4251 when I moved from Sacramento to my home in Clovis, California, over 17 years ago. It was only used for a short period of time, and was still in perfect condition. On August 23, 2012, just a few weeks ago, I finally got the 4251 installed on my home here in Clovis. Maybe a talented machinist could back engineer the channel master parabolic antenna if the just could borrow one to work with. It might be worth pooling money from a bunch of enthusiasts to get the project funded. Then some enterprising entrapanuer could start making them and selling them on the net. There probably would be a lot of buyers, especially if they cost a lot less than a Wade parabolic. I still have my 4251 in storage. it was my desire to have it installed. But health and age made this impossible. Fellow installers tell me to list on E-Bay. And it’s value has sky rocketed over the years. I still have JFD corner reflector antennas in boxes still gold in color from the 60’s and many more.Is it time to make a will?